a little mummy magic: Banoffee Pie (my fave)! 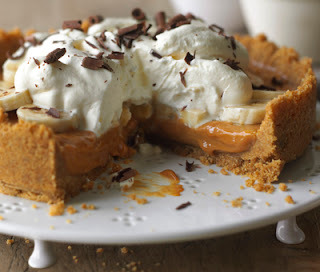 Wow i do so love a Banoffee Pie - i would say its my favourite dessert but i think all desserts are my favourite haha!!! This is an amazing dessert on 3 counts!! Firstly its so quick to make you can make it within 15 mins and take to bar b q or event! Thirdly it tastes and looks amazing!!! Firstly crush the biscuits into crumbs - I normally put mine in a ziplock bag and get honey to hit and roll them with a rolling pin! Place the crumbs into a bow and add the melted butter to the biscuits. Once mixed press onto bottom of a lightly greased 20cm cake tin. Pop in fridge for 10 mins. During this 10 mins (which is an eternity for an impatient 3 year old) i get Honey to cut the banana with her special plastic knife! Take the base out of the fridge and spread the carnation caramel over the base - ive said 1 or 2 cans depending on how caramelly (i know thats not even a word but i like it) you like it! I would then place this in the fridge to harden up! Then place you banana slices on top of the caramel - try not to leave many gaps. Spoon the cream on top and then grate some chocolate on top! Taaaaa Daaaaa !!!! Fool Proof quick and easy dessert!!! You can also use condensed milk and boil it however with toddlers in the house and a previous burn incident i just try not to over complicate things! It does seem to set better though! Also you could make these into little ones in fairy cake wrappers and make them in a 6 cake tin for the children!